Calo des Marmols (the marble bay) is located in the south-east corner of Mallorca. 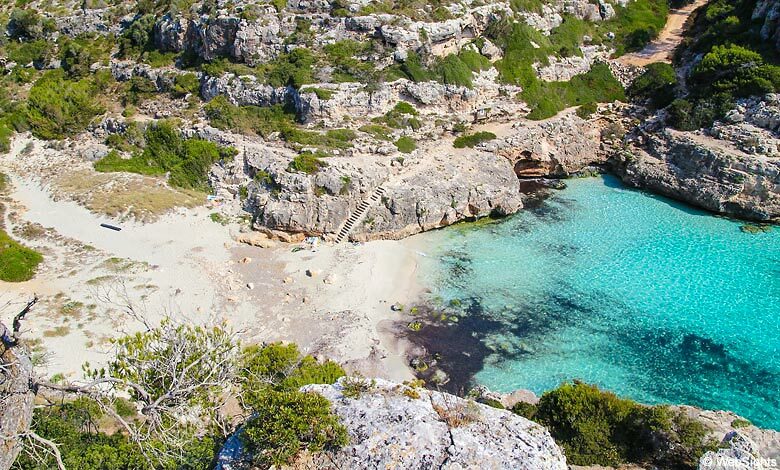 Calo des Marmols is a remote but wonderful bay, far away from Mallorca’s bustling resort towns and overcrowded beaches. 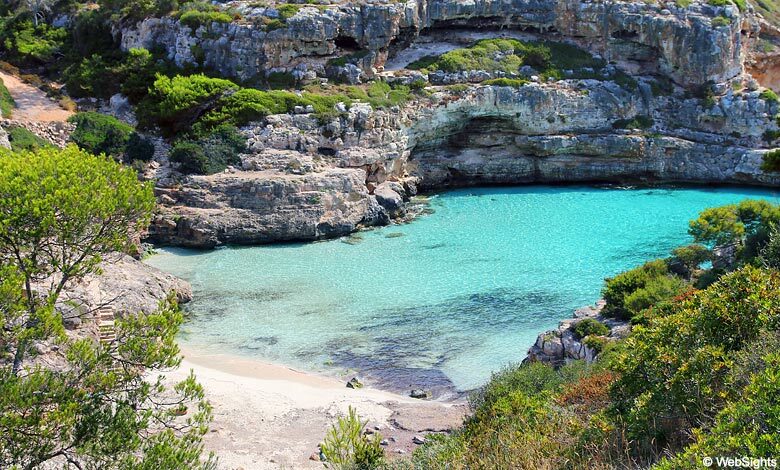 Deep in the bay lies the 40-meter-long beach, which is surrounded by high cliffs. The sand is light and neat but is mixed with some gravel. The crystal-clear water shimmers in blue and turquoise colours and invites you to a swim in the adventurous ocean. There are not many visitors. Some come by boat, while others walk the 5.5 km. long distance from the lighthouse in Cap de ses Salines, the south tip of Mallorca. It is a tough hike, especially in the heat, but the surroundings are quite unique and worth the trip alone. 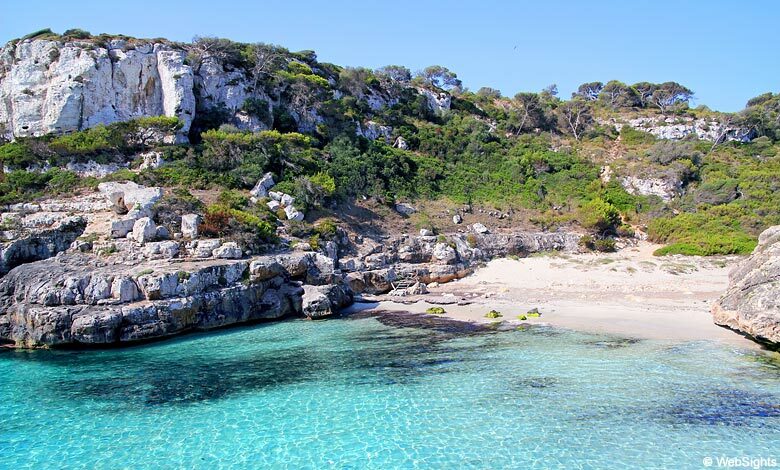 There are no facilities at Calo des Marmols, so be sure to bring plenty of drinks and food from home. The beach itself is very child-friendly, but the long hike is certainly not. There are no water sport activities around, but the bay is ideal for snorkelling, due to the very clear water. There are even a few small caves in the area that you can explore. There are no bars or restaurants at Calo des Marmols, and not at the parking lot either. In the south of Mallorca, there are only a few holiday resorts. The closest is Colonia Sant Jordi, which is located approx. 10 km. in a north-westerly direction. The slightly smaller holiday town of Cala Santanyi is located just as far away to the northeast. However, those who visit Calo des Marmols often come from the resorts further away or by boat. For smaller yachts, the bay is a perfect place to throw out the anchor. As the map shows, the beach is located deep in the beautiful marble bay with the turquoise water. If you zoom out on the map and follow the coast to the southwest, you will see the lighthouse in Cap de Salines, where you can park your car. From here there the hike will be approx. 70 minutes long.